Over the past month, Soft CGM has been in Alpha mode. There are many ways to define what that actually means. At Aspire, we describe it as a fully functioning product used by internal users. In the case of Soft CGM, there have been three of us: myself, Neal Landis (developer for MedStatix and a Type 1 diabetic), and Tom Rogers, Chief Software Architect for Aspire and a Type 2. For the past few weeks, we've been providing Soft CGM with our insulin, carbohydrate and fingerstick data. In my case, I've also been sending heart rate data via an Apple watch. If you've watched the Soft CGM video, you know that what makes this product unique is that multiple adaptive algorithms are competing to be the one chosen to provide current and future blood glucose estimations. This particular feature of the app has worked flawlessly, with each adaptive algorithm optimizing itself on a nightly basis and delivering a new personalized model to the app with progressively higher accuracy over time. How accurate is Soft CGM at this point? Not too shabby for an Alpha version. In this figure, you can see the Clarke Error Grid for all of the 766 predictions during the test. In fact, 95.5% of these estimations fell within Zones A and B of the grid. In a study published comparing Dexcom to Medtronic Enlite, Dexcom performed best in a home study, with 98% of readings within Zone A and B. Medtronic had 94.4%. 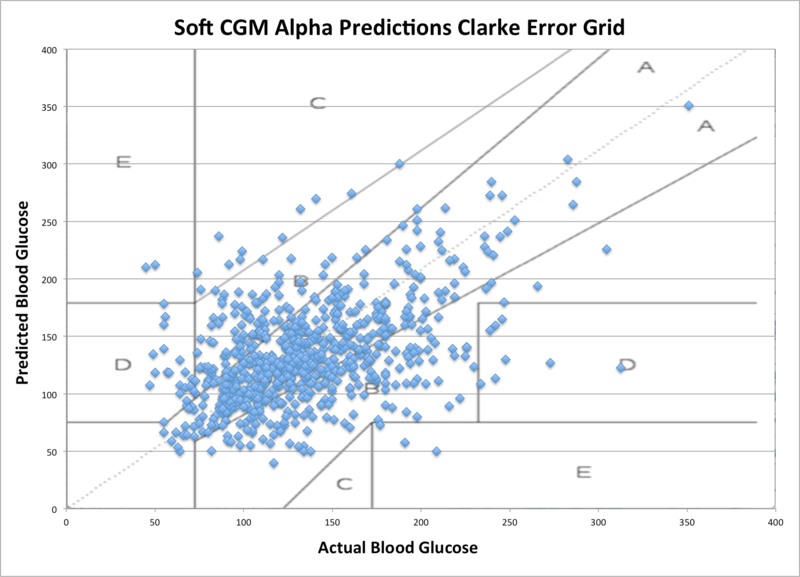 While less than our own results, it should be noted that Medtronic had 64.6% within the highly coveted Zone A, whereas Soft CGM had only 55.2%, all of which goes to say that while we have a lot of work to do, we're quite encouraged by what we've seen so far. To that end, next week kicks off an official beta test of Soft CGM. Twelve users outside of the Aspire family will be using the app for a thirty day period. In the coming weeks, we'll be sharing updates and results as the beta test progresses.